Hello and Welcome to the Atomik Mobile Disco & Karaoke Web Site. We supply Mobile Disco’s, Karaoke’s and Mobile DJs for all kinds of parties and events in and around the Edinburgh area, including East Lothian and Midlothian. We are a full time professional mobile disco company. Each year we supply our Mobile Disco’s, Karaoke’s and recommended DJs to hundreds of parties and events, including: Wedding Receptions/Celebrations and Civil Partnerships; Birthday Parties; Anniversary Parties; Retirement Parties; Graduation Balls and all types of Social and Private Events! Every booking matters to us, each job usually leads to another and so on. To this day recommendations remain the single biggest source of new business for us. You can take comfort from this, knowing that should we provide the Mobile DJ, Mobile Disco or Karaoke entertainment for your event we are also investing in our future too. and we have the know-how! And absolutely everything else in between - with expertise second to none! Our DJs will always create a great party atmosphere with their personality and the music that they will play. They will also play a selection of music suitable for all ages and tastes attending the Party/Event. They are also very happy to take and play suitable requests on the day of the Party/Event or you can send us a song list in advance. Specialist DJs for every occasion! We are absolutely confident that you will not be disappointed in our DJs. We can help you plan your event - from the first dance to the finale! Expert guidance with years of experience is always on hand. We are very knowledgeable about all different types of events, whether it be formal or informal and understand all your concerns. We confirm all bookings in writing - it makes life easier for the Hirer and gives them absolute peace of mind. This typifies our level of professionalism. Over the years we have worked in all biggest hotels in Edinburgh and some small ones too! We have also worked in a massive amount of Social Clubs, Pubs, Schools and Community Centres. The list is truly comprehensive. Click Here to have a look! Enjoy your visit and please do not hesitate to contact us if you have any questions regarding any aspect of our service. 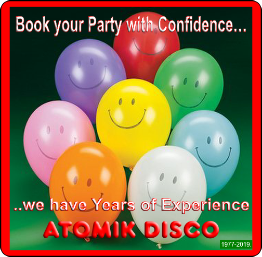 Atomik Mobile Discos & Karaokes - Book with Confidence. 28 Pages of our Website! Let’s get Your Party started - on any day or night!